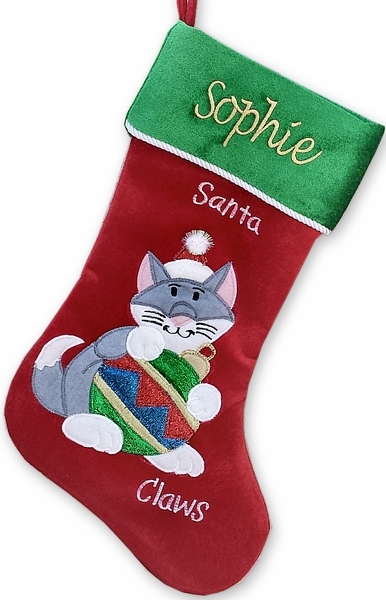 Velvet Cat Christmas Stocking, the best for the best. Personalized with your cat's name free of charge. Materials and Design: The body and cuff of this Christmas stocking is made from velvet and the appliques are framed in metallic embroidery complementing the velvet colors. The cuff is trimmed in silver metallic rope to give the Christmas stocking that finished luxury look. Lining: The inside lining is in matching color satin. The stocking is also padded inside between the lining and the exterior velvet, which gives the stocking soft feel, it holds its shape very nicely - just a superior quality workmanship!